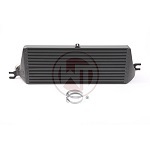 R57 MINI Cooper S Convertible 2009 and newer Intercoolers and Intercooler accessories. Manufactured by Forge Motorsport, Helix, NM engineering, and Cravenspeed. An Intercooler is one of the biggest bang for the buck mods for and R57 Cabrio S. Other intercooler parts help improve airflow like the turbo discharge pipes, and boost tap.